If you’re among the 20 percent of American adults who experience heartburn at least twice a week, it’s time to see your doctor. Heartburn is a burning sensation in the chest or throat. 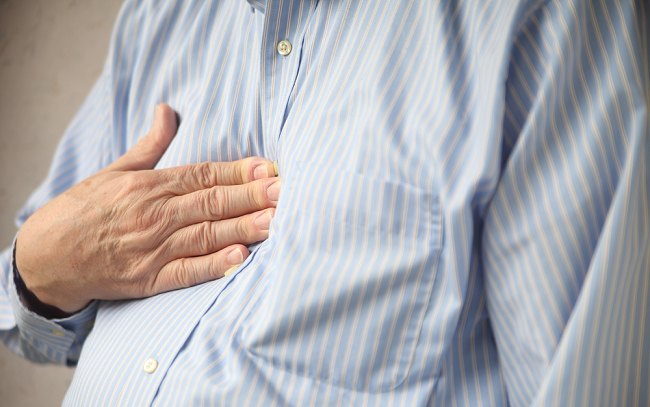 Recurrent heartburn is the most common symptom of gastroesophageal reflux disease, also known as GERD or “acid reflux.” With GERD, acid from the stomach flows backward into the tube — known as the esophagus — that connects the mouth and stomach. The condition is more common during pregnancy, in smokers, and in people who are overweight. Dietary triggers may include fatty foods, chocolate, peppermint, coffee, tea, alcohol, and carbonated beverages. Eating a large meal and lying down shortly afterward can also cause reflux. Heartburn is the main symptom of GERD, but other signs or symptoms include dry cough; asthma symptoms, such as wheezing and a feeling of tightness in the chest; hoarseness; a burning sensation in the throat; and trouble swallowing. Some degree of reflux is normal in everyone, but it becomes GERD when the symptoms are frequent or when the acid damages the lining of the esophagus. Chronic acid reflux can actually lead to ulcers, blockages, or even cancer — so it’s important to see a doctor and receive early treatment. Decrease the amount of caffeine, alcohol, and fatty foods in your diet. Do not eat three to four hours before bedtime. For some people, over-the-counter medications can relieve GERD symptoms, while others may need prescription medications. Antacids (such as Tums or Rolaids) work well for quick relief of occasional heartburn by neutralizing acidic contents in the stomach. Over-the-counter H-2 receptor antagonists (Pepcid or Zantac) can help control the symptoms, while proton pump inhibitors (Nexium, Prilosec, Protonix, or Prevacid) work by actually decreasing the amount of acid produced by the stomach. Proton pump inhibitors are stronger and usually more effective than H-2 receptor antagonists, but only one inhibitor is available without a prescription. If you experience painful swallowing, weight loss, or chest pain along with heartburn, inform your doctor, as these symptoms could indicate the need for further testing to rule out other serious health conditions. If you’re experiencing any of the symptoms listed above, talk with your primary care doctor about getting a diagnosis. Don’t have a doctor? Find one here.